So my May-October CSA is in full harvest mode; when I go to the weekly pickup, I need to bring two big cloth shopping bags and several plastic bags (for, you know, the loose stuff, like salad mix and herbs). I practically have to waddle back to my car with it all. With only two people in my household, we really have to work to get through a week's share of vegetables. Fortunately, our three chickens are happy to eat the wilting leftovers when Thursday rolls around again and we still haven't finished off all the lettuce or cilantro. The cat, alas, is worthless in the veg department. Because everything is local and seasonal, the vegetables don't change drastically from week to week; we've had lettuce for many a week now, while the heirloom tomatoes were new last week. So, while we have a few standby recipes we trot out again and again — Cilantro-Pecan Pesto, Tomato-Basil Bruschetta, baba ganouj, and plenty of fresh salads — the latest round of produce often has us scratching our heads, trying to come up with new flavors for familiar foods. We love green beans served in a simple salad, for example: stemmed, sliced, blanched, and dressed with a homemade vinaigrette and chopped parsley or dill. But after three rounds of this, you kind of want something else. So on Friday night, I threw the beans into a wok, thinking I might dry-fry them Chinese style, with garlic and chiles. But, rooting around in the fridge, I turned up some yogurt, which made me think, Nah, I'll make an impromptu curry instead. Green onions, tomatoes, and garlic from the CSA got sautéed in curry spices first while the beans blanched, then everything got whisked together and the yogurt added as the dish was cooling. Served over fresh basmati rice, it was fast, tasty, and filling. Saturday night we took a house guest out to eat, so the crowded fridge stayed crowded. But Sunday? 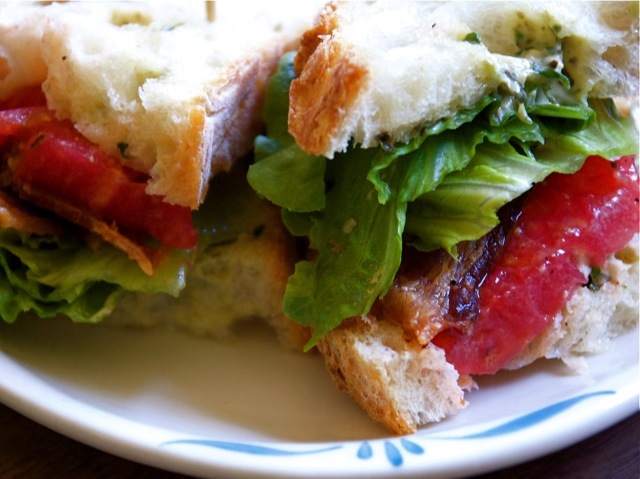 Sunday was BLT day, a sandwich we'd been holding out for until we got some truly excellent heirloom tomatoes. I could rest on my spicy laurels. But an evening of BLTs only knocked off a few lettuce leaves and one enormous tomato. And we only have a few days to go before the next pickup looms, and our fridge is still crammed with beets, kohlrabi, lettuce, squash, cucumbers, and onions. Yikes.